The other day, I made a Questions and Answers post in a natural hair group. I do this every so often when I have the time so that women can get the hair care help they need. A lot of women were asking about hair products, and since most of the women in the group live outside of the US, I didn’t feel comfortable answering because what’s readily available to me, may not be readily available to them. This lead me to thinking how can I help without recommending specific products, and I realized that I never had an ingredient list post. Hence, this post was born! Just like the name implies, these ingredients cleanse hair. They can be found in shampoos, cleansing conditioners, and cowashes. You really don’t want to see them anywhere else – especially the sulfates – because they’re designed to remove dirt and build up off of the hair and scalp, meaning that if they’re left on the hair, they can cause dryness. In terms of the sulfates, I have no opinion on them, I’ve used them without problem. But some women are senstivie to them, so avoid if you’re starting out on your journey or need a more gentle shampoo. As the saying goes, only water can provide moisture to hair. Aloe vera juice too. While all the other ingredients have their benefits, water and aloe vera juice are the kings of imparting moisture back into hair. So if your hair is really dry, spray with water or aloe vera juice, then seal that moisture in with a butter or oil to prevent moisture loss later on. Emollients and conditioners help to soften hair, as well as help replace the natural oils lost during manipulation (washing, styling, detangling, etc.). Many emollients and conditioners have dual purposes that include benefits for hair – such as adding slip for easy detangling - and improving the quality of the product. Fixatives are designed to help hair hold its style by limited the ability of hair to absorb moisture. This is both a good thing and a bad thing (and one of the reasons why I avoid them). It’s a good thing because it can hold a style for a long time without the need to restyle, but it’s also a bad thing in that it prevents moisture from getting to the hair. So if your hair needs to be moisturized daily or every other day, stay away from these ingredients! While many of these ingredients are also conditioners, they help condition hair by strengthening it, thus getting their own category. These ingredients contain protein to help strengthen and prevent/reduce damage to hair. Everyone should have a protein deep conditioner and use it once or twice a month, but too much protein can be counterproductive making hair hard, dry, and brittle. Avoid or limit proteins in other products, especially if you’re protein sensitive. If those products do contain protein, make sure they’re further down the ingredient list. Humectants attract water to the surface of the hair helping keep hair moisturized longer. Some women avoid humectants in dry weather because they say it makes their hair drier. A good work around is to spray hair with water or aloe vera juice, before applying a product with a humectant. 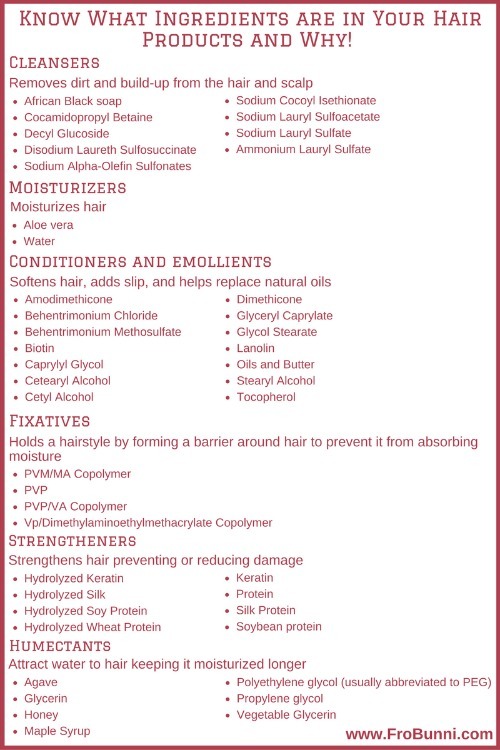 These are just some other ingredients I’ve seen in a lot of hair care products, which have various purposes. While a touchy subject, the reality is if you get products on the shelf, they will contain preservatives. There’s no way around this because preservatives will help keep a product safe for you to use. You can’t mix a bunch of oils, water, and other ingredients together and hope that dangerous pathogens don’t form…they will. If you’re concerned, you have one of two options. Either make your own products or learn a little bit of science. Many women who make their own products use food-based ingredients like baking soda for a cleanser and yogurt as a conditioner. At the beginning of my natural hair journey, I would make my own sealants using shea butter, olive oil, coconut oil, castor oil, and more. And only a couple of years ago, I was trying to my luck with using baking soda as a shampoo. This method has pros and cons, and to be honest, I have way too many thoughts about it to detail in this post, so stay tuned for another post on food-based, DIY hair products in the near future. But before I move on, I will say that you need to be careful with build-up on hair and skin using this method. You cannot use butters and heavy oils on your hair and scalp, and then try to rinse it away with some apple cider vinegar. It just won’t work because apple cider vinegar doesn’t have the strength to remove something as thick as shea butter. I will explain this at a later time, but keep this in mind. The other option, and it’s one I’ve taken to, is learning a bit of science. Preservatives don’t concern me because I decided to do some research on them. And by research, I mean I’ve started to learn how science and scientific research work. I can thank Natural Haven for starting my interest in this, as well as learning research skills from getting a Master’s in Library Science. Many women are scared of preservatives, particularly parabens and formaldehyde releasing products, but I found some interesting things out. The fear of parabens comes from a paper conducting by Professor Philippa Darbre where parabens where found in breast cancer tumors. Many people believed that this meant that parabens caused cancer, when even Dr. Darbre said they you couldn’t conclude such from the paper, but that more research needed to be done. As detailed in Natural Haven, the paper did not report if parabens can be found in normal, non-cancerous, breast tissue; where the parabens came from; and if they caused cancer in the first place. Since parabens are naturally found in fruit and vegetables (and there’s the same amount of parabens in an apple as there is a bottle of shampoo), you can imagine why assuming that parabens cause cancer can be a bit of a problem. In terms of formaldehyde, you’ll be surprised to learn that your body naturally produces formaldehyde to make amino acids…yup, science is pretty cool. The amount that’s released into hair products is significantly less that what your body is producing daily. Of course, these aren’t going to be the only ingredients you see; there will be many more that have benefits for hair and help ensure the safety and quality of a product. If you want to learn more about hair ingredients, check out Cosmetic Info. They keep a very detailed and informative database of almost every ingredient found in hair products, and other cosmetics, such as makeup, lotion, and sunscreens. Natural Haven is also a great resource, especially for natural hair products. 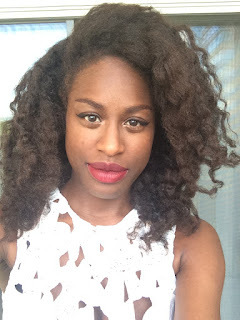 Hopefully, this post has helped many be able to go out and confidently purchase hair products that will work for them. 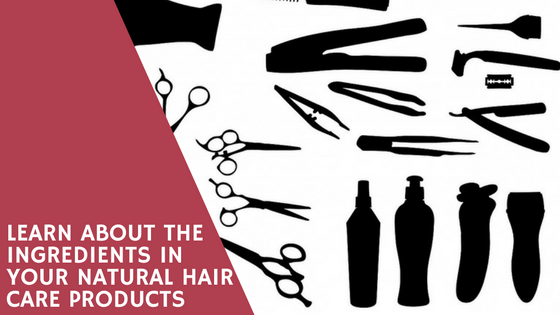 I know that finding natural hair products can be quite frustrating, costly, and time consuming, but learning more about the ingredients used in these products can make for an easier search and a happier hair journey.